Orange County Government’s mission is to serve the public with fairness, integrity and character, excellence and innovation, professionalism and accountability, and a strong work ethic – a testament to the values that Dr. Martin Luther King, Jr., envisioned for our nation as the preeminent advocate for civil rights, equality and dignity for all. 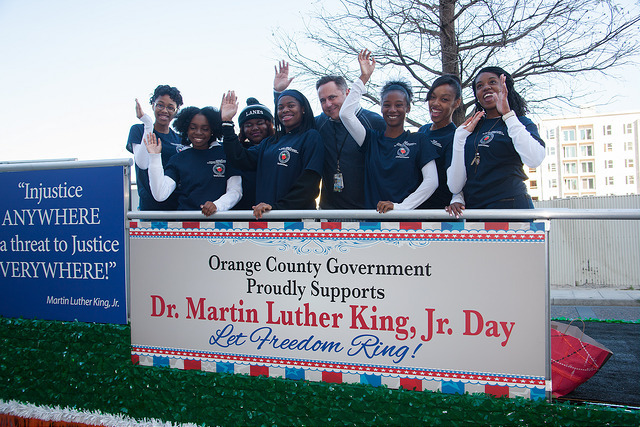 Orange County sponsored and participated in several community events in January and February that commemorated Dr. King’s teachings of courage and sacrifice, and Black History Month, which celebrates African-American heritage. In January, Mayor Teresa Jacobs joined Florida Sen. Geraldine Thompson and City of Orlando Mayor Buddy Dyer to honor the legacy of local aviation pioneer Elizabeth “Bessie” Coleman with an official street designation ceremony. Coleman overcame poverty and racial and gender discrimination by becoming the first African-American woman to receive a pilot’s license and fly a plane. She passed away in 1926, but remains a national symbol of perseverance and a testament of America’s pioneering spirit. Mayor Jacobs and other local and state elected officials also spoke at the 24th annual “Pappy” Kennedy Prayer Breakfast honoring the legacy of Dr. King and Arthur Kennedy, Orlando’s first African-American elected city official. Mr. Kennedy, who passed away in 2000, served on the Orlando City Council from 1972-1980. The breakfast is presented annually by the YMCA of Central Florida. This year, YMCA partnered with the Southwest Orlando Jaycees and featured guest speaker Retired Rear Admiral Barry Black, U.S. Navy, the 62nd Chaplain of the U.S. Senate who previously served as Chief of Chaplains of the U.S. Navy. Additionally, West Orange County’s hometown celebrity Sisaundra Lewis, a finalist on NBC’s singing contest “The Voice,” shared her talents at the event. After speaking at the breakfast, Mayor Jacobs joined District 1 Commissioner Scott Boyd, District 2 Commissioner Bryan Nelson and students with Family & Friends United, Inc. on the County’s parade float at the City of Ocoee’s annual Unity Day Parade. Hundreds of Orange County citizens gathered with officials from the City of Ocoee to honor Dr. King’s dream of equality and opportunity for all. Orange County also participated in parades coordinated by the City of Apopka, the Town of Eatonville and the City of Orlando. In February, Orange County also took part in Eatonville’s Zora! Festival, which celebrates the life and work of writer, folklorist, and anthropologist Zora Neale Hurston. Orange County’s Arts and Cultural Affairs Advisory Council has been a financial supporter of the Zora Festival for a number of years. Mayor Jacobs also received a key to the Town of Eatonville from its Mayor Bruce B. Mount at the event. Just last week, Mayor Jacobs spoke at Orange County Government’s Black History Month Celebration Luncheon, held annually on the lawn of the Orange County Government Administration Center. Coordinated by the Black History Committee of Orange County (BHCOC), festivities included delicious food, live music and information booths. Orange County and the BHCOC have worked together for many years to develop programs and activities to support the goals and achievement of the nation’s brave and beloved African-American civil rights and community leaders. A collection of photos documenting Black History Month in Orange County are available for use by the media and are located on Flickr.